Reluctant lawyer, Jamie Quinn, still reeling from the death of her mother, is pulled into a game of deception, jealousy, and vengeance when her cousin, Adam, is wrongfully accused of murder. It’s up to Jamie to find the real murderer before it’s too late. It doesn’t help that the victim is a former rock star with more enemies than friends, or that Adam confessed to a murder he didn’t commit. There’s big trouble in the park system. Someone is making life difficult for Jamie Quinn’s boyfriend, Kip Simons, the new director of Broward County parks. Was it the angry supervisor passed over for promotion? The disgruntled employee Kip recently fired? Or someone with a bigger ax to grind? If Jamie can’t figure it out soon, she may be looking for a new boyfriend because there’s a dead guy in the park and Kip has gone missing! With the help of her favorite P.I., Duke Broussard, Jamie must race the clock to find Kip before it’s too late. If Barbara Venkataraman had not contacted me about doing a Great Escapes Book Tour I would have missed these books and that would definitely been my loss. Jaime Quinn is a wonderful protagonist. We meet her as she is trying to recover after her mother’s death. She doesn’t feel like going to the office at all. She has a Family Law practice dealing mainly with couples getting divorced and she just can’t deal with that right now. Then she received a frantic phone call from her aunt. Her cousin has been arrested for murder. Well that would shake the cobwebs out of anyone’s brain but Jaime’s cousin has Asperger Syndrome and Jaime knows there is no way he killed anyone. She hooks up with an old client, a P.I. named Duke and together they are going to find the real killer and make sure her cousin is kept safe. 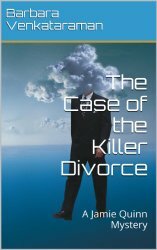 Then in The Case of the Killer Divorce , one of Jamie’s clients becomes the prime suspect in a murder investigation. 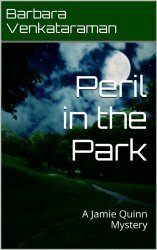 In Peril in the Park , Jamie’s boyfriend Kip needs her help and before she can get to the bottom of his problem he goes missing. In all three stories she teams up with P. I. Duke to solve the case before the police can. There is also a subplot running through all 3 books of Jaime trying to find her father. Her friend Grace has the right contacts in the right places that moves this along very quickly. These stories are short, the 3 together are just 338 pages so they are a very fast read but they are not short on details. The characters and plot-lines are fully developed and very well written. With each story we get to know Jamie, Duke, and Kip better. The supporting characters are fleshed out as well. The author takes on some issues too, Aspergers, political corruption, mental illness. She does this all without being heavy handed or preachy. Jamie is always fighting for wrongs to be righted. I really enjoy this character. While these stories have a bit of suspense they are balanced well with humor and romance. Duke is quite a character and can always make Jamie laugh. These stories ended much too soon. I am thrilled to learn Engaged in Danger will be released soon. 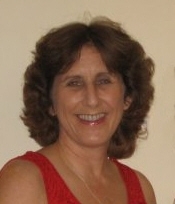 Award-winning author, Barbara Venkataraman is an attorney and mediator specializing in family law and debt collection. She is the author of “Teatime with Mrs. Grammar Person”; “The Fight for Magicallus,” a children’s fantasy; a humorous short story entitled, “If You’d Just Listened to Me in the First Place”; and two books of humorous essays: “I’m Not Talking about You, Of Course” and “A Trip to the Hardware Store & Other Calamities,” which are part of the “Quirky Essays for Quirky People” series. Both books of humorous essays won the “Indie Book of the Day” award. 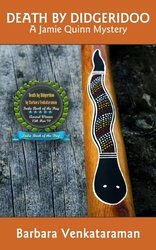 Her latest works are “Death by Didgeridoo ,” first in the Jamie Quinn series, “The Case of the Killer Divorce ,” the second Jamie Quinn mystery, and, just out, “Peril in the Park ,” the latest in the popular Jamie Quinn series. Coming soon, “Engaged in Danger“–the next Jamie Quinn mystery! The author is giving away 1 copy wither E-Book or Audio! Contest is open to anyone over 18 years old. will earn you 3 Bonus Entries. Leave a comment for Barbara for 5 Bonus Entries. Barbara Venkataraman is a new author for me. Thank you for the giveaway. Sounds like a great new series and love that it will be fast reading! Thanks for the chance to win. Another series to add to my TBR list, it’s growing faster than I can read and get anything else done too. 🙂 Thanks for introducing to new series and authors, keeps our minds active and engaged. Sounds like a great series. Thank you for this opportunity! Oh wow. These sound fantastic and I love the cover art for them. How have I not heard of these before?! Spotlight/Giveaway – Death by Tiara by Laura Levine Cozy Wednesday with Terrie Farley Moran – Author of Caught Read-Handed – Giveaway too!